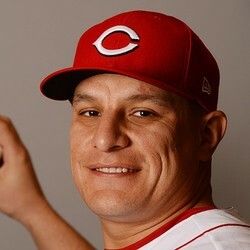 David Hernandez has signed a two-year deal with the Cincinnati Reds. Financial terms were not disclosed, but it is worth $5 million according to the Cincinnati Enquirer. The 32-year-old Hernandez had a solid 3.11 ERA last year with the Diamondbacks and Angels. He should be a nice candidate for holds, but Raisel Iglesias has a firm grasp on the closer's role.